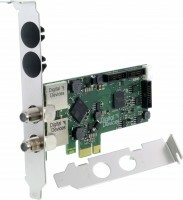 Productinformatie "Twin Tuner TV card DVB-S/S2 (PCI Express) - DD Cine S2 V7A"
HD / UHD Twin Tuner TV Card for DVB-S/S2 and digital SAT-Radio for the PCI Express Slot. Suitable for high resolution transponder thanks to the latest demodulator technology (STV0910A - Impoved Version compared to STV0910B ) for high DVB-S2 transponder data rates up to 180 Mbits/s. The Cine S2 V7A is equipped to receive channels which are disseminated via satellite (DVB-S and DVB-S2 transponders) and can be used for displaying, recording and analysis of MPEG2 (SD / HD H.262) MPEG4 (SD / HD H.264) and HEVC (HD / UHD H.265) signals. The Cine S2 V7A is equipped from factory with 2 full tuners (twin tuner technology). So you have the possibility to receive two different transponders at the same time. Use this feature to receive two different satellite transponders (frequencies) simultaneously, for example to record a channel and watch another one. Each tuner works independently, so are all data from the transponders available. Over the OnBoard Located Expansion Ports (3x), the card can at any time to expand via expansion modules. For example, use Twin Tuner expansion modules, the raise up the card to 8x full Tuner by using only one PCI Express slot. How all Digital Devices products, also the Cine S2 V7A supports Singlecable Reception - UniCable to EN50494 and UniCable II / Jess to EN50607. Under Windows it is directly supported by driver, so that each application can be used. In Linux OS, the corresponding application must control the single-cable method. Through the use of high quality components, the Cine S2 V7A ensures a long life even in 24/7 server operation. Through the small dimensions of the Cine S2 V7A, its can be mounted in low and full profile PC cases (PCs with low and full-height). The power consumption without LNB power at only 3 watts in full operation and works on the GreenIT standard. 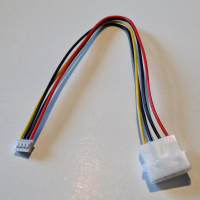 About the OnBoard located Molex - Sherlock power plug, can optionally Satellite systems, which need a large amount of current via the coaxial cable, an extra power (By default, not required). Also expansion modules can directly be supplied with power over this port. Corresponding power cables, see accessories. This product was developed and produced in Germany and has strict controls in the area of quality and environment protection and is free from environmentally hazardous substances, like electrolyte or tantalum capacitor. Verdere links naar "Twin Tuner TV card DVB-S/S2 (PCI Express) - DD Cine S2 V7A"
Q: Ich habe nur ein Satellitenkabel, kann ich trotzdem beide Tuner der Karte nutzen? A: Beim Empfang von DVB-S/S2 kann eine Satellitenleitung leider nicht ohne weiteres auf gesplittet werden, da es 4 verschiedene Empfangsebenen gibt, auf dem sich ein Tuner bewegen muss. Um die entsprechende SAT Ebene zu erreichen, wird ein Steuersignal an den SAT Multischalter oder LNB geschickt, welches dann die entsprechende Ebene bereitstellt. Wird eine SAT Leitung auf gesplittet, müssen sich beide Tuner in der gleichen SAT Ebene befinden, damit ein Empfang möglich ist. Wenn Sie nur eine SAT Leitung zur Verfügung haben, wäre evtl. die Erweiterung auf Unicable eine Option, sprechen Sie uns einfach an, wir beraten Sie gerne. Q: Benötigt die Karte eine zusätzliche Stromversorgung ? A: Nein, es sei denn es kommen SAT Komponenten zum Einsatz, welche viel Strom ziehen und so der PCIe Strom nicht mehr ausreicht, in diesem Fall kann über den Sherlock Stecker auf der Karte, zusätzlich Strom bereitgestellt werden vom Computernetzteil. Q: Kann ich den Stromanschluss der Karte zur Versorgung von Erweiterungsmodulen verwenden ? Q: Die Karte hat einen PCIe x1 Sockel (kurz), kann ich diese auch in einen PCIe X16 (lang) Steckplatz auf dem Mainboard stecken, z.B. wo die Grafikkarte steckt ? Q: In welchem Format nimmt die Karte auf ? A: Die Karte stellt lediglich die Daten bereit, welche von der DVB Software verarbeitet werden. Das verwendete Aufnahmeformat liegt bei der jeweiligen Anwendung. Q: Ist mit der Karte Radio empfang möglich? A: Ja, allerdings muss das Radio Signal DVB konform ausgestrahlt werden. DAB ist nicht möglich !